A coalition of civil rights activists this week called on the Federal Department of Justice to investigate what they say is the Washington State Corrections Department's dismal hiring record for people of color. The activists gathered to announce their call for U.S. Attorney General Eric Holder to investigate why the state’s prison system only employs a total of three people of color in its administrative services division, out of a total of 39 administrative officials. The community leaders also demanded an investigation into why corrections has systematically failed to post job openings or hire from outside of the system, instead using direct appointments to fill high-level jobs. “A culture of institutional racism has become systemic and experienced at all levels in this state agency," the letter to Holder reads. “It is absolutely essential that diverse employees be hired to help inform the agency on how to best manage those individuals and connect with communities of color to elicit their help to appropriately re-enter offenders after their release,” the letter says. The Washington State Department of Corrections remains committed to recruiting and retaining a diverse workforce and maintaining a work environment that is inclusive and respectful. The agency’s leadership makeup aligns closely with broader State of Washington population demographics. The Department of Corrections embraces diversity through a variety of efforts, including annual diversity and inclusion plans, 20 Diversity Advisory Councils statewide, required training for all department staff on respect in the workplace, and inclusion of core values in each employee’s formal evaluation. The agency is also an active participant in various cross-agency activities focused on diversity such as persons with disabilities, veterans, and women in government. We acknowledge that diversity is multi-dimensional and covers a broad spectrum – from race and ethnicity, to gender and sexual orientation; from socio-economic status and physical abilities, to religious beliefs and age – and everything in between. We join with the NAACP and other interest groups in their concern regarding the overrepresentation of people of color caught in our criminal justice system and we have a common interest in changing the trend. Renton City Councilor Greg Taylor told The Skanner News that the issue is about improving employment trends for communities of color and holding top state officials accountable for fairer hiring practices. 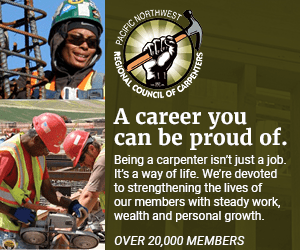 Taylor, as well as Seattle community organizer Eddie Rye Jr., underscored Washington’s Initiative 200 – passed in 1998, it prohibited use of racial quotas in hiring – as the culprit in the bad job numbers. Rye went further in criticizing Washington State Corrections Secretary Bernard Warner as well as Gov. Jay Inslee, who he said have been unresponsive to community meetings for the past several years. “With the department of corrections, out of 40 people, you have one minority in the top administrators, and people are going and getting positions without any competition, no job announcement and the secretary is doing as he damn well pleases. “And he's doing it in violation of title VII of the 1964 Civil Rights Act. “Folks in this state have to understand that I-200 does not supersede the 1964 Civil Rights Act,” Rye said. “One of the things to that is evident is that initiative 200 inspires these types of decisions, explicitly or implicitly, the notion that you don't have to create opportunities for African Americans or Latinos in the hiring process,” Taylor said. “People of color, they all pay sales tax, gratuity tax, real estate tax, in some form or fashion whether they're buying or not, and those dollars are utilized by local, county, state, and federal governments,” Taylor says. The group gathered this week to call for a federal investigation of corrections hiring reads like a who’s who of civil rights activism in Washington, including Seattle NAACP president Gerald Hankerson; A Philip Randolph Institute President Verlene Jones; Renton City Councilor Greg Taylor; Tacoma Black Collective co-chair Lyle Quasim, Seattle Black Firefighter Association President Roberto Jourdan, Black Dollar Days Task Force Executive Director Robert L. Jeffrey, Sr.; Tacoma NAACP President Rev. Gregory Christopher; Northwest NAACP Vice President Sheley Secrest; Seattle University School of Law Professor Henry McGee; Washington State Black Christian Clergy President Rev. Lawrence R. Willis; and Rye of the Community Coalition for Contracts and Jobs. “That's why we went directly to the attorney general — we’ve talked to the governor for the last couple of years, we’ve been in meetings with the secretary, but obviously the meetings mean nothing to the governor or the secretary because there's been no changes,” Rye said. “The thing about it is that you have a lot of people that have come together behind this very important issue, and this is just the tip of the iceberg.